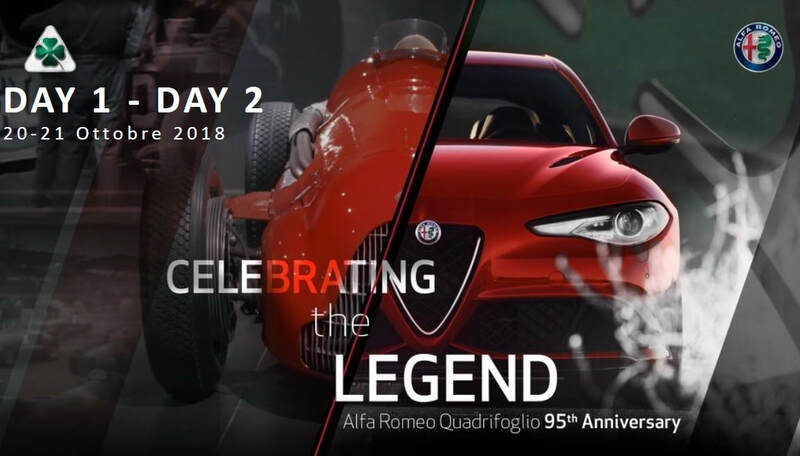 Abbiamo preso parte alla sessione di sabato mattina sulla pista di Balocco all'Alfa Romeo Quadrifoglio 95th Anniversary. Marco Stella con la sua Alfa Romeo Giulia Sprint Gt V si classifica 2° nella Classe TC1600 a 57 centesimi dal primo! Stelvio Quadrifoglio al Nurburgring - 7'51.7"
Fabio Francia si ripete al Nürburgring con la Stelvio Quadrifoglio e stacca il nuovo record per un SUV con 7' 51.7"
​Born to face any challenges, even the toughest one: Stelvio Quadrifoglio wins the world's fastest SUV title breaking the record of 7'51.7'', the second for the Alfa Romeo Quadrifoglio on the Nürburgring track. Stelvio Quadrifoglio with an all-wheel drive systemQ4 coupled with a 2.9 V6 Twin-Turbo engine of 510 hp gets an extraordinary record, reaching another important result in the history of this brand. On this episode of Head 2 Head presented by Tire Rack, Jason Cammisa and Jonny Lieberman are in a bind. Before having driven Alfa Romeo's first rear-wheel-drive sports sedan in 30 years, they didn't know what its closest competitor would be. So they brought all of them: a 2016 BMW M3 Competition Package, a 2016 Cadillac ATS-V, and a 2016 Mercedes-AMG C63 S. After looking at hall-of-fame race car driver Randy Pobst's laptimes around Chuckwalla Valley Raceway, they picked the strongest competitor to do battle with the Alfa. Then, the duo hit the road to see which is the best midsize luxury sport sedan. Fabio Francia fa il nuovo record al Nürburgring con la Giulia Quadrifoglio con cambio automatico a 8 rapporti in 07’32”. The 510 hp of the most powerful road #AlfaRomeo ever created are managed by the new 8-speed automatic transmission with shift paddles: in Race mode, it shifts gear in just 150 milliseconds. Enjoy the on-board full-lap video of the fastest sedan in its category. 4C vs Giulia GTAm e SZ ES-30. Ultima prova del campionato vetture turismo.